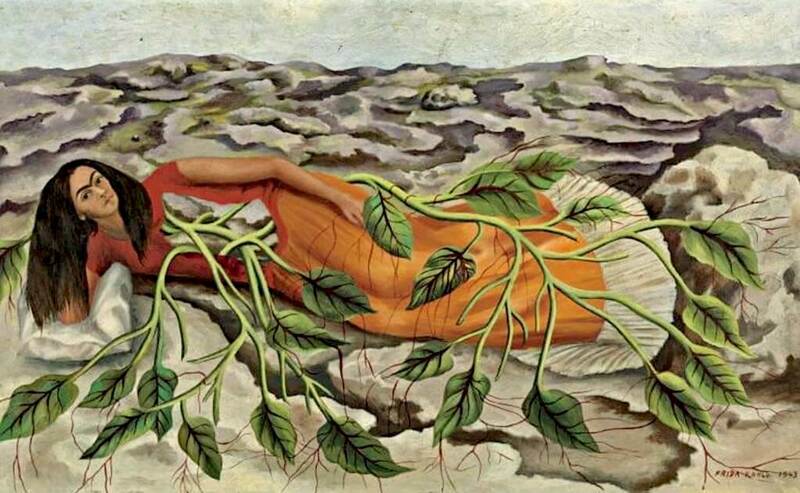 In this painting, Roots, 1943, Frida stated her faith that all life can join in a single flow. In this painting, Frida is depicted as her torso opens up like a window and gives birth to a vine. It's her dream of being able to give birth as a childless woman. Frida's blood circulates the vine and reach beyond the leaves' veins and feed the parched earth. She is dreaming to be a tree of life with her elbow supporting her head on a pillow. Also with her Cathloc religion background it's possible she is trying to mimic Christ's sacrifice by having her blood flowing to the grape vine. This implication of a sacrificial victim is also reflected in a few of her other paintings. This painting can also be compared with another Frida's painting, My Nurse and I. These two are a reversal of each other. In My Nurser and I Frida is a baby who was feed by the Mexican woman using her breasts looks like plant. In Roots it is adult Frida is nourishing Mexican earth. But in this painting, there are some danger to the artist's dream of fulfillment: a crevasse is opening next to Frida on the ground. Which is an implication that her dream might be waken pretty soon. In May of 2006, this painting was auctioned at Sotheby's in New York and sold for $5,616,000....setting a new record for the artist. It was sold to an anonymous phone bidder. Rumors within the art world say that the anonymous buyer was the pop star "Madonna" who owns other Kahlo originals.